International Women's Day (IWD), originally called International Working Women's Day, is marked on March 8 every year. In the year 1914, International Women's Day was celebrated on March 8 for the first time. The dates continued to fluctuate till the mid-40's. The UN theme this year is "Equality for Women is Progress for All". >> International Women’s Day is a time to reflect on progress made, to call for change and to celebrate acts of courage and determination by ordinary women who have played an extraordinary role in the history of their countries and communities. >> This year’s theme, “Equality for women is progress for all” emphasizes how gender equality, empowerment of women, women’s full enjoyment of human rights and the eradication of poverty are essential to economic and social development. It also stresses the vital role of women as agents of development. "Countries with more gender equality have better economic growth. Companies with more women leaders perform better. Peace agreements that include women are more durable. Parliaments with more women enact more legislation on key social issues such as health, education, anti-discrimination and child support. The evidence is clear: equality for women means progress for all." “On the occasion of the International Women’s Day, I extend warm greetings and good wishes to women in all parts of our country. I thank them for their invaluable contribution in the making of our great nation. Women in India have attained greatness through the ages – in political, academic and spiritual spheres. They enjoyed freedom and equal participation in public life in ancient India. In the Rig Veda, women are placed at the highest pedestal – ‘Yatr nariyastu poojayante ramante tatr devah’ or where women are worshipped, Gods preside there. The Taittriya Upanishad teaches us ‘Matridevo bhava’ or ‘Let your mother be God to you’. 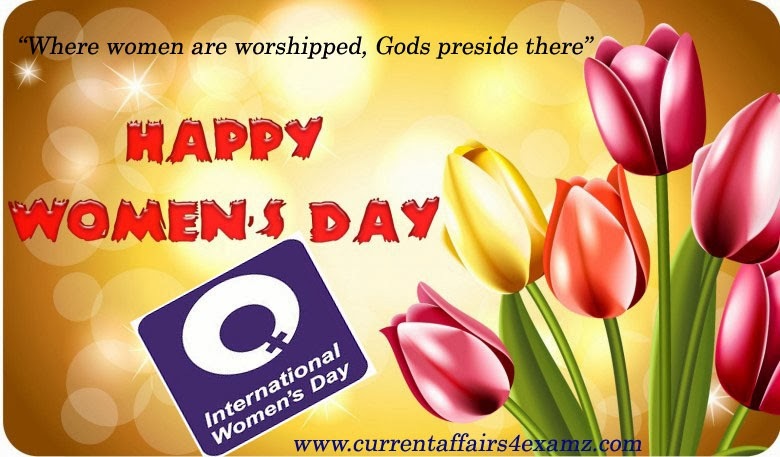 Swami Vivekananda rightly said, “All nations have attained greatness by paying proper respect to women. That country and that nation which does not respect women has never become great”. 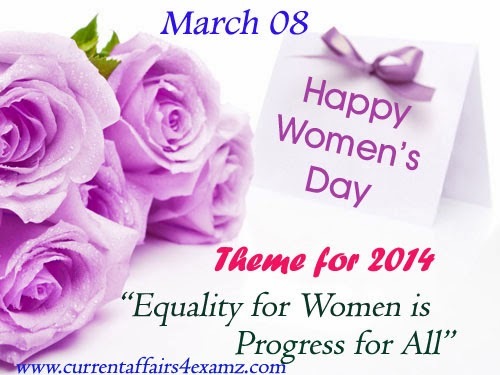 The principle of gender equality is also enshrined in the Indian Constitution. Not only does the Constitution grant equality to women, but also empowers the State to adopt measures of positive discrimination in favour of women. Empowerment of women must be regarded as not only an element of our efforts towards gender equality but also a critical step for stimulating their full participation in nation building. We as a society must work towards changing negative perceptions about women. Women should be provided a safe, secure and congenial environment in which their talents can flower and they can contribute their full share in the building of our nation. 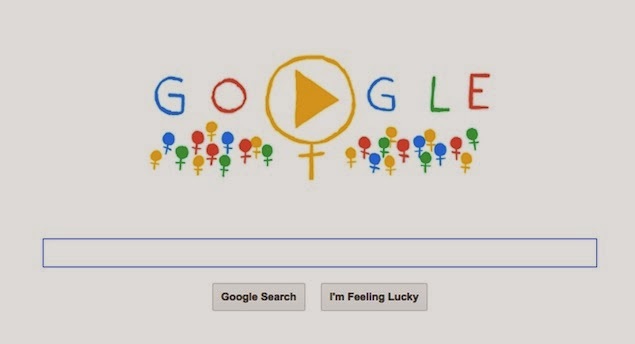 >> Women's Day 2014 doodle can be seen on Google's home page across the world. Interestingly, the video-based doodle first made an appearance on the eve of International Women's Day on Friday, and not too surprisingly, it continues to be showcased on the day that celebrates women's achievements in various spheres of life. >> In the doodle, the Google logo features a play button in the second 'O' of the logo, which also depicts the Venus symbol for women - a small circle, with a cross below it. The Google logo in turn is surrounded by more Venus symbols. Hitting the play button causes a YouTube video to open up. The video has women from all walks of life wishing people Happy International Women's Day. Amongst other famous female personalities, the video features Malala Yousafzai and Asha Bhonsle.